It's been so long since I've posted I thought my first post back in should be quilt related and, well, just plain fluff. Mom and I attended again this year, together. We make a full day of it and have a great time just hanging out. Here, I made her pause in the cold and windy weather to take a photo for you. She'll always stop for a photo! This bundle of fabric that I love but have no use for. It was a 5 yard bundle for $30. There was another lady petting it but her friend talked her out of it, told her it wasn't very pretty. What's up with that? I think it's beautiful! Fat quarters for the #sweatnsew challenge I was running on Instagram (now you know that between home life and work, my other free time has been on Instagram). A nifty tool for making Lemoyne stars blocks. I'm convinced this is going to make my life easier with these stars that I love and will be reporting soon on this particular tool. Small, pre-printed whole cloth fabrics. I want to use these and practice some tarpunto quilting by machine. This is a quilting bucket list item for me. A paint kit so I can dye my own fabrics. I've seen this for years but this year, I decided to take the plunge and get some tools. I think I'm really going to enjoy letting a little creative out of me with this but as with the star tool, I want to clean some things off my plate first before I add more to it. Lastly, one of those things to clean off, mom bought these fabrics so I can make her a tote. Don't you think this will look great! She's got a love of batiks and the price of these was unbelievably good. Almost a steal! As for the rest of the show, I think I'll let most photos speak for themselves. The labels first, then the quilt. Enjoy. Those quilts are impressive!! I wish I could have seen some of them in person. I have also been wanting to make the Ship Shape Tote!! I love the pattern! I think the bundle is beautiful. That lady had rocks in her head. God on you for snaffling such a lovely bargain. Looking forward to seeing your report on the Lemoyne Star blocks. I really need to get a few more templates myself. The Ancient Mariner quilt is gorgeous. Imagine how long it took to get those points so perfect! And the texture on Antelope canyon is amazing. I could probably do that ! I wonder how long the complex Irish chain took? Eek... all those pieces just gave me a stress attack. 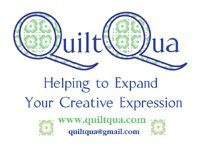 Thank you for sharing all the beautiful quilts you seen at the show. It looks like you had a wonderful time with your Mom.